Gin category Winner of the Flaviar Community Awards 2018. 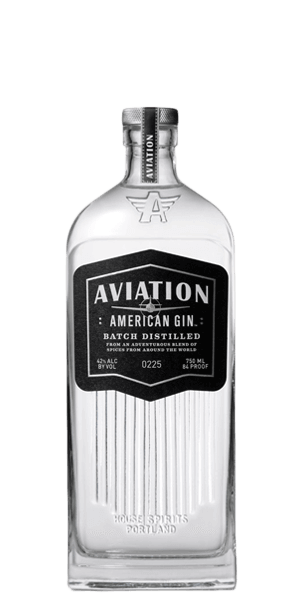 Aviation Gin takes its name from the classic Aviation cocktail. Distilled in Portland US, by Lee Medoff and Christian Krogstad, who teamed up with Seattle mixologist Ryan Magarian to produce a new style of Gin. In 2006, after nearly 30 rounds of trials and adjustments, their vision became reality when the trio felt they had finally captured the essence of their obsessions. The Aviation took off. But, is Aviation Gin really a Gin? It depends how you look at it, we believe it is. Distilled from rye, it carries a rich flavour and an excellent, somewhat oily mouthfeel, quite different from your typical London dry Gin. What does Aviation Gin taste like? The Flavour Spiral™ shows the most common flavours that you'll taste in Aviation Gin and gives you a chance to have a taste of it before actually tasting it. Juniper and cardamom infused milk. Hint of smoke and freshly cut grass, with spa-like characteristics driven by the lavender, coriander and sweet orange. Spice notes from caraway, anise and pepper. Pleasantly heavy rye and spice entry with floral lavender and anise top notes, followed by juniper, cardamom, coriander and dried orange peel. Lightly sweet clean finish with citrus pith, some peppery spice and lite smokiness. Juniper is there but cardamom is its equal companion. It is a Gin that you can also sip neat or on the rocks. Smooth, bright citrusy gin. Very enjoyable. Definitely a sipping gin. Ryan Reynolds sells it well! This was someone of a different Gin taste for me. It was somewhat lighter than others. But did have a unique spiciness upfront and I did get a hint of smokiness in the back with a definite Annise flavor. Definitely somewhat more oily or unctuous than your regular gin. I have had it neat and will be trying it in a martini soon. It is a very mild Gin, not bad but not something that will wow you. I keep it in my bar for those who will not appreciate a really outstanding gin. For me it was just OK. Maybe I need to not let so much time pass between me tasting the bottle and me leaving a review, but I remember being rather ho-hum about this. There were some stronger flavors I don't really like in a gin. Not that they were overpowering; just enough to put me off. I am a big fan of Bombay Sapphire but after trying this I may just have to change my rankings. Was very mild and enjoyable. If he continues to make gin this good he won't ever have to do a movie like Green Lantern again. Very pungent anise flavor. Heavy in the mouth; almost oily. Not my preference for a martini, which is really the only way I drink gin. For a martini I’d go for something lighter and cleaner. Maybe I’ll try it neat. People seem to make a big deal about the Ryan Reynolds connection but hey, more power to him! It’s got a decently smooth feel but leaves a rubbing alcohol after taste. I’m not much of a Gin guy though. Smooth taste. Better add campaign. Go Ryan Reynolds. Compared to quite a few other Gins, this seems overpriced. It is a good, intense, gin with a rich & spicy birth; while an oily life; leads to a lightly sweet & clean finish with a hint of smokiness. Distinctive smooth taste, great with mix or clean. meh decent enough for mixing, not drinkable by itself. Very interesting with a strong cardamom and anise flavor. I’m not a gin enthusiast and I could totally drink this. Juniper with a hint of lemon or lemongrass makes this very drinkable. Nose has juniper as expected, but also strong, bright citrus zest (oranges and lemons), accented with florals underneath. Lavender notes lead the flavors up front, along with an earthy yet sweet tone from sarsparilla, somwhere between liquorice and root beer. Juniper gradually becomes more present with its evergreen flavors harmonizing nicely with the sweet and floral ones. The finish is spicy both from the rye-based spirit and cardamom, with juniper, anise and sarsparilla carrying through. Mouth-feel is very smooth, slick and oily... this is a gin one can really 'chew' on when sipping neat. In a G&T the lavender and sarsparilla are unlocked, giving a sweet, refreshing result, like an artisinal soda-pop. Overall this is an outstanding gin with amazing texture and a strong, but deftly harmonized flavor profile. Drinkers of the juniper-forward London Dry purist school may eschew this one, as the ubiquitous berry here works more in an ensemble than in a leading role, but for rhe adventurous gin fan this is definitly a must-try. I am not a gin drinker but this could change my mind. I drank this straight and was intrigued by the complex flavors. What a bargain for this at $35. If ketel one were a gin, it would taste like this. Lemon up front. A little floral. Then spicy. Good on the rocks or as a mixer. I still prefer Brooklyn on the rocks and Hendrick’s for a mixer, but you can’t go wrong with this. "Nose - 2.5 Taste - 4.0 Aftertaste - 3.0 Overall - 3.3"
Gin and tonic tends to be my standard cocktail. My first impression of Aviation was good, but there was just something I didn’t like. Just a hint of a ‘heavy’ taste which I think they listed as blood on the flavor wheel. Not my favorite. I’m not a fan of gin, but this was great! Got it in a Tasting Box, and have to admit I want more! Very pleasantly surprised and definitely changed my mind about gin. This Gin surprised the hell out of me. I usually avoid gin because I don't want to drink a pine tree. This is nothing like that at all. It's floral and I also get a heavy cardamom note. My new favorite Gin, love in Gin & Tonic with lime or on its own. Very refreshing. Not being totally in love with gin, this is one I enjoy. Smooth, with gentle floral notes that make it a great gin for simple cocktails or just to sip. Tastes like gin. I didn't like it as much as Ryan Reynolds apparently does. My go-to gin! Great on the rocks with a twist of lime or in nearly any cocktail. Loved the smoothness of the gin with and without the tonic. It has just a nice hint of spice from the anise along with the notes of lavendar and citrus. One of my favorite Gin, starts out sweet with hints of lavender, and finishes with the spices. Very smooth. I enjoyed this gin. I found it a bit more harsh with the spice and cardamom than most gins I've had, but the taste was pleasant and refreshing. Bought it twice... 2 thumbs up... plan on going well beyond the “3 times a charm”... I was charmed on the first drink... good for G&T’s and Martinis dirty. I love gin and this was a good gin. The aroma was as expected which is a good sign to me. The flavor was easy to take in and enjoy. Very pleasant gin. Not like others I have tried. Almost sweet, not as bitter, easy to drink straight, aftertaste doesn't linger on long.